My daughter is having a Steam punk wedding so I made these little bouquets for her bridesmaids. 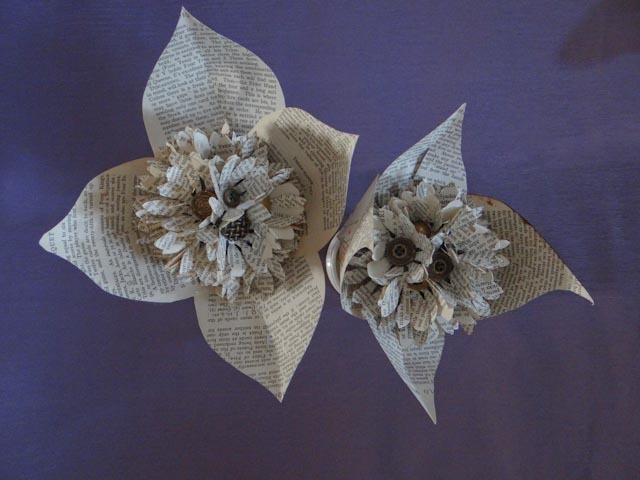 They are made from an old card games book! I have to admit I had to overcome a lot of hesitation to actually tear out the pages of a book, but the paper was a dream to work with. 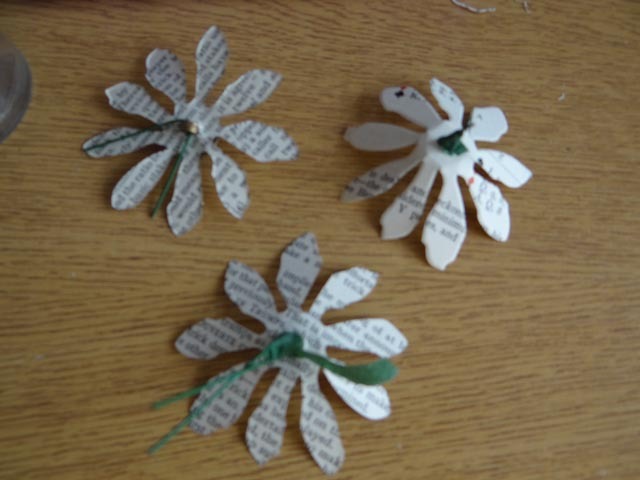 I have a wonderful clutter bug which made the cutting out of the flowers very easy but any flower punch will do or you can just use the template on this tutorial and use scissors. You can stack the pages to make it easier and cut a few out at a time. 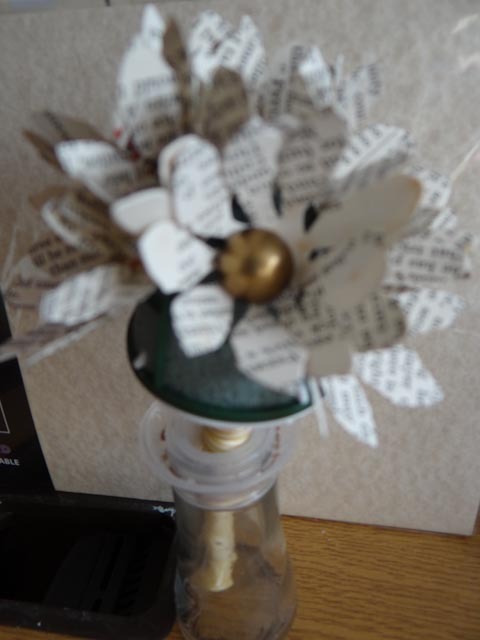 Then take a button and place it in the centre of the flower and pass the wire through the back of the flower. There are two types of button the ones that work best have a shank at the back that makes it easy to pass the wire through. If you have a normal two or four holed button then pass the wire through two holes and then push the wire through the centre of the flower from the front to the back. Using the florist tape wind the tape around both wires to secure the button, work up slowly until the tape has secured the button to the flower. Cut the ends of the wire to size. Gently fold the flower petals upwards so they curve gently round the flower. If you are using wider petals (like roses) you can use an embossing tool to gently smooth the outer edges of the flowers which gives a realistic curve. 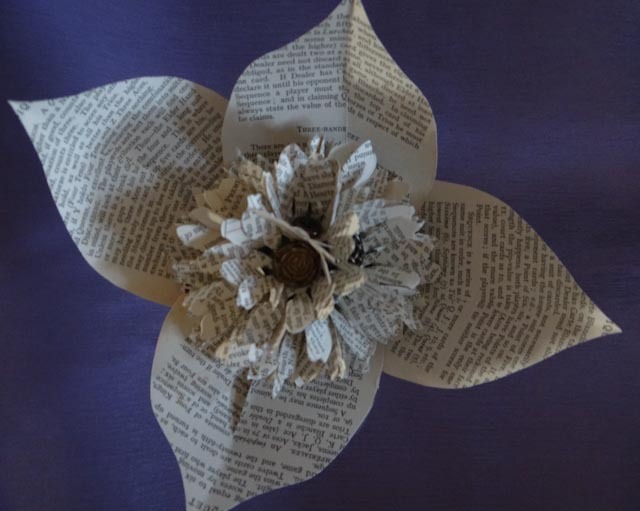 If you want a more aged effect you can gently brush the outer edges of the petal with some distressing ink. Once you have made your eleven (or any odd number) of flowers, press them into your cone, start with one in the middle then add three in equal parts around it, then fill in the spaces with other flowers until you have a pleasing bunch. It helps if you put the cone in a tall glass or vase to keep it steady and upright while you work. 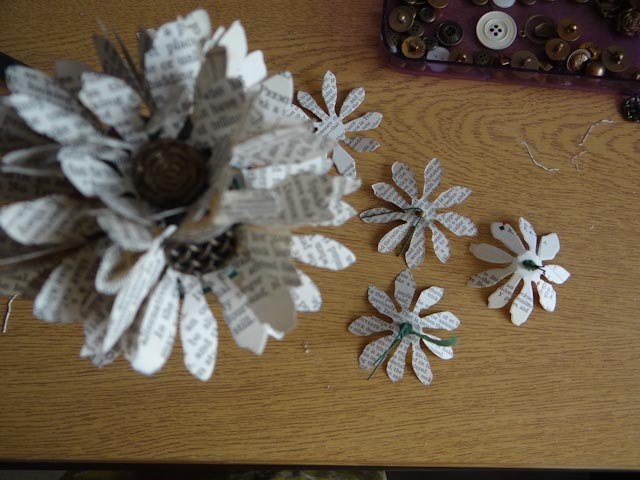 Finally cut out the leaves, using the template and attach one half then using the cut, shape the leaf and glue the other half so that the leaves are curved. You can use more leaves if you wish but four makes it look fairly even. Use a paint brush and distressing ink to age the leaves if you wish. Wrap the ribbon round the stem of the holder, gluing as you go. It might help to start with a small strip across the end, then use a sharp angle to wrap the ribbon along the base finishing just under the leaves. Templates for flowers and leaves can be emailed on request.